Delete Selected Deletes selected part from the mp3 document. Delete Unselected Deletes unselected part from the mp3 document. Change Volume Changes audio volume by specifying a percentage value. Maximize Volume Increases volume as high as possible without distortion. 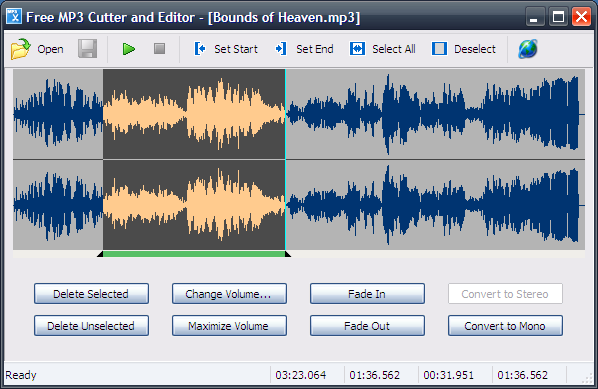 Fade In Gradually increases the volume throughout the selection. Fade Out Gradually decreases the volume throughout the selection. Convert to Stereo Duplicates mono track to make a stereo track. Convert to Mono Mixes all channels to make a mono track. 924 2,425 musetips.com <img src="https://www.oldergeeks.com/downloads/gallery/thumbs/Free MP3 Cutter and Editor1_th.png"border="0"> Apr 14, 2019 - 11:31 2.8.0.1610 861.6KB ZIP , out of 20 Votes.